* Flowers that grow more naturally. This information is as important for growing organic vegetables as it is for flowers. Below I describe the flowers that have special value for organic gardeners. Grow them wherever you can to improve your garden's natural potential. They will help to nurture pollinators and natural pest predators. Did you know that insect pollinators prefer open single flowers to double flowers? And some highly bred flowers have lost qualities that are desirable for organic gardening. So look below to find the garden flowers that attract hoverflies, ladybirds, praying mantis, bees, and hummingbirds for example. These clear bright yellow and orange flowers are a blaze of colour. They are easy to grow in moisture retentive soil in sun or partial shade. You can use the flowers in drinks, soups, stews or salads. Prolong flowering and prevent seed dispersal by dead heading or harvesting. You get an abundance of summer garden blooms from summer to first frosts. Attracts pest predator insects including:- hoverflies and 'ladybugs', as well as butterflies. 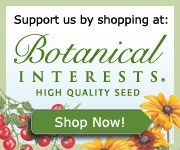 Check below to find seeds & plants for organic flower gardening. Yellow button heads surrounded by ray florets above ferny leaves. This hardy perennial likes a well-drained sunny spot. It's one of the top providers for friendly insects. Attracts:- Hoverflies, Lacewings, Ladybirds, Ground Beetles and Parasitoid Wasps. A quietly contrasting flower color for the garden or as cut flowers for vases. 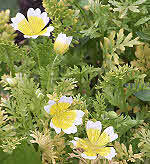 Excellent choice for a wild flower garden and is well-grown among shorter flowers for support. Attracts:- ladybirds, lacewings, as well as small parasitoid wasps that kill plant pests. Also provides supplies for seed eating birds. 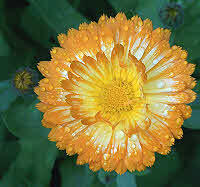 A popular plant among gardeners that provides pollen and nectar. The feathery leaves create a less formal foil for the flowers. Several variety names include the word 'ladybird'. Attracts:- hoverflies, lacewings, and parasitoid wasps to help control your garden pests. Also reported to attract hummingbirds. More stars for flower gardening:- Echinacea purpurea 'Purple Cone Flower' - Tagetes 'Marigold' - Plants & flower seeds are here. Flowers that are rich in pollen and nectar provide an energy boost for important pest predators. When their larvae eat your plant pests they protect the source of flower food that they eat as adults. Flower gardening with these plants increases the survival of pest predators and helps to protect your garden. Grow More Flowers - Send Flowers Now!! Flat topped flowers above ferny foliage make this an excellent plant to cut for vases. But leave some for the garden. 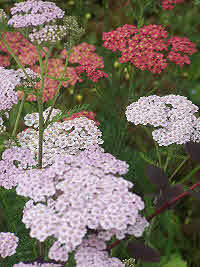 Because Yarrow also attracts beneficial insects to your garden. Attracts:- hoverflies, ladybirds, parasitic wasps - just what you need to help control garden pests. The plant has also been used as a beneficial herb. 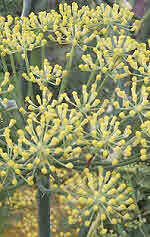 Fennel enjoys rich well-drained earth. Bronze leaved varieties are available too. Attracts:- lacewings, hoverflies, ladybugs, parasitic mini-wasps and the swallow tail among butterflies. Grow in free-drained fertile soil in a sunny position. Coriander has a strong scent, can be used as herb and has small white umbel flowers. Attracts:- lacewings, hoverflies, ladybugs, parasitic mini-wasps. For neat lower growing flowers try Candytuft in sun on well-drained light or heavy soil including chalk. It spreads out at 25cm / 9 inches high to form low flowering domes from May to September. An excellent plant to warm up the space between low to medium sized shrubs and taller perennials. You can propagate it by cuttings from May to July. A robust and tolerant perennial that starts flowering from around July. Often maligned in America, but its tall stands of yellow flowers are well-used as cut flowers in vases. Check out more compact varieties for gardens. Attracts:- hoverflies, ladybirds, lacewings, bees and butterflies. Some people use parts of the plant as a health food. This personal favourite of mine has the most lovely summer scented flowers. 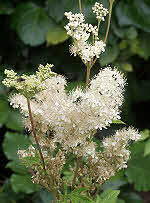 Meadowsweet was prized by the ancient Druids and is reported to have health giving properties. I tried the exquisitely scented flowers, with some stalks and leaves in tea, and was instantly charmed by its distinct vanilla flavour. Meadowsweet flowers produce an abundance of pollen. They attract small black insects that are sure to be beneficial. Although these may not control pests directly they will help to feed other animals that do, such as spiders. Agastache has lots of organic shape to offer your flower gardening display. Their attractive flowering spires nestle seamlessly above the leaves. Verticals add depth to your display while the clumps blend well in a natural setting of low to medium sized shrubs and perennials. There are many varieties. The plant is related to mint and has scented leaves. It prefers sun and well-drained earth and flowers from summer until first frosts. Attracts:- Butterflies, Bees and - Hummingbirds with rupestris species. Beneficial Insects Eat Away Your Pest Problems. Small black wasps with no sting and Tachinid flies generate parasitoid larva that eat and kill pest caterpillars and grubs. Lacewing larva feed on aphids and mites. Hoverfly larva eat aphids and mealy bugs. Ladybug beetles and their larva voraciously feed on aphids. well-drained soil. Keep the plants trimmed and take cuttings April to July to propagate them. Attracts: Bees, Hoverflies, and other visitors. Another scented garden flower with additional uses. Easy to grow in sun to partial shade on either light well-drained or moist heavy soils. You can use the leaves to make aromatic teas with the flavour of 'Earl Grey'. Attracts: bees, butterflies and humming birds. Humming Birds are also attracted by Salvia 'sage', Oenothera 'Evening Primrose', Penstemon 'Beardtongue', and Perovskia atriplicifolia 'Russian Sage'. Tubular flowers are visited by animals that have long tongues. Use these brightly coloured flowers to create low borders or fill blocks between larger plants. Mix with Tagetes for the ultimate organic flower gardening display. Dead head the flowers to prolong the season into August. Allowing some seeds to set will guarantee a glorious display for next year. And you will be able to transplant some of the germinated seedlings in the autumn. Attracts: Bees and Hoverflies. Don't be surprised to find a few small bees hiding in the foliage during spring. A pretty flower listed by Garden Organic in the top ten for attracting beneficial insects. Enjoys sun on dry to moist soils including nutrient poor sites. Does not tolerate cold wet conditions. Easy to grow from several nice varieties that readily self-seed. The evening perfume from this flower will stir your passions. It is especially attractive to humming birds. Among trees in the U.K., Willows are host to the largest number of insects. It's a reminder that native species are often the best to grow. Willow can also be grown as an ornamental shrub. And of course its early spring flowers will help retain beneficial insects in your garden. 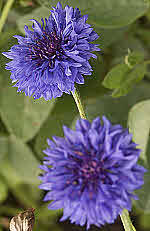 These are ideal for under planting among shrubs and near to fruit bushes. They enjoy shade and partial shade. With flowers in February and March they will help attract pollinators to your early flowering fruit. Why not grow these daisy like flowers near your fruit bushes - they attract spring pollinators. Easy to grow in sun or partial shade and, like many fruit plants, they enjoy slightly acid soils. Ivy attracts dozens of bees and hoverflies at the end of the season. It also provides cover for hibernating butterflies. You might harvest a few of the sweet scented flowers to include in a scented bowl, although they are rather short lived. Do remember that the berries are poisonous. 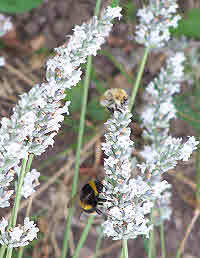 There are many more attractive plants both tall and short that attract beneficial insects for organic flower gardening. So take a look at and select from the attractive organic flowers by using the links below. Remember that the more sophisticated double flowers and hybrids are usually not as valuable for attracting nature's friends to your garden. So I don't include these varieties in my organic flower gardening list. Do you want to send flowers straight away? When your garden flowers can't provide the special surprise gift that you need check these popular florists. You'll find ready-cut flowers for vases, bouquets, and special occasions. Sow Seeds or Buy Plants? With organic flower gardening the choice is yours on the links below. and more for your garden - check the navbar on this link. Start here to select beautiful flowers that will stir your garden into life. You can find already grown beautiful plants from this link. 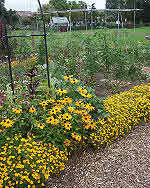 ^ Grow more with organic flower gardening.